The amount of human growth hormone in the adult body is usually measured by checking the blood IGF-1 level, and proper IGF-1 clinical studies can be done to measure the effectiveness of any HGH product. There are now many different products on the market, yet only a few have undergone double-blind placebo IGF-1 clinical trials to measure their effectiveness at actually increasing human growth hormone in the body. Of those few brands the clinical studies done on our ProBLEN formula showed the best results, and only our studies were done independently. The Effects of Homeopathic Human Growth Hormone and Pituitary Extract Administered to 21 Adult and Elderly Subjects Deficient in Growth Hormone. Objective: Determine the therapeutic efficacy of combinations of homeopathic substances (human growth hormone and pituitary extract) on adult and elderly subjects with adult-onset human growth hormone deficiency. Method: Five month treatment/placebo was administered to 21 adult subjects between the ages of 45 and 86 who were deficient (average baseline Somatomedin-C (IGF-1) values of less than 70 ng/ml). These otherwise healthy subjects were randomly assigned to one of three groups. Oral administration of 2 sprays three times over a day of either the homeopathic formulation or of placebo. Study done by: Dr. Juan Hernandez Flores, Lic. Irais Castellanos Mungula, at the Centro Geriatrico Naturista, Mexico D.F. The patients taking the formula saw an average 160.6% increase in their blood IGF-1 levels at the end of the 5 month period. The evidence shows that the effects of the formula are not temporary as seems to be the case with other types of non-prescription therapy such as amino acids. This is of paramount importance since patients will want the product to produce benefits that are sustainable. These results are the best ever obtained independently with a non-prescription product. What is the difference in the clinical studies done on our HGH formula and those done on some other product's formulas? In our study the testing was done using patients with a known growth hormone deficiency. This usually comes about due to the pituitary gland not releasing human growth hormone as it should. Our clinical studies were more of a challenge yet our formulas did help the patient's pituitary glands to release more HGH. If you look closely at the clinical studies done on other products you will notice that some of their patient's IGF-1 results were obtained after only one day of therapy, while the results of other patients in the same study were obtained after many months of therapy. We have no explanation as to why their testing was carried out in this way, but it appears they reported the patient's highest IGF-1 result, whether that patient's level was highest after only one day of therapy or after 6 months of therapy. Of course any result obtained and reported after only one day of therapy could not possibly be an accurate result because the body did not have time to adjust and level off. Also, I cannot imagine they would record an IGF-1 result obtained after only one day of therapy and be done with that patient after only the first day. They obviously were hopeful the patient's IGF-1 level would increase even more as the therapy continued, so they obviously had the patient continue the therapy. By the fact they ended up reporting an IGF-1 result obtained after only one day of therapy we know the IGF-1 results obtained on that patient after that first day must have been lower than the first day's result. This does not speak well for their formula if in some patients it works best on the first day. The clinical study results of other brands. The studies done on our formulas tested every patient the same amount of time, 5 months, using the same testing criteria and guidelines, which is the proper way of testing. The IGF-1 results obtained on the day the 5 months of therapy concluded were the results that were reported. 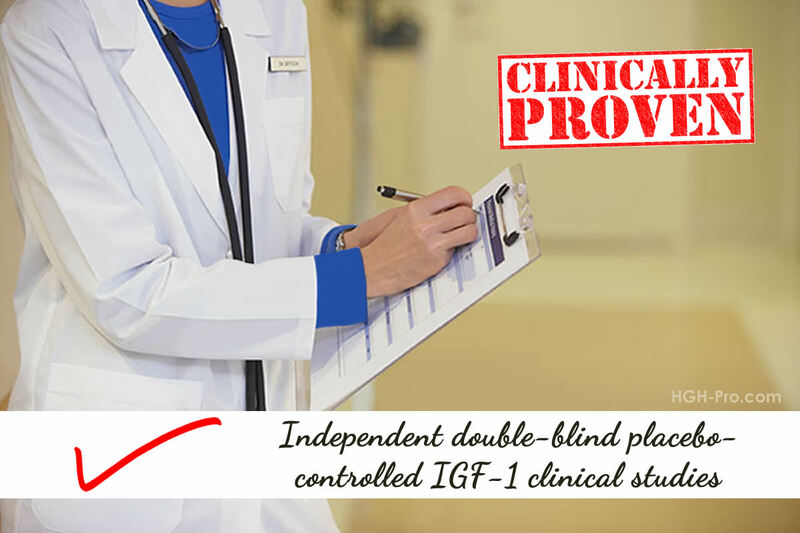 We could not go back and report an IGF-1 result that was obtained at an earlier date if that result was higher than the end result, which seems to be what some who have reported clinical results have done. Some companies do their own testing. Product testing should not be done by the owners of the formula or the product because they stand to gain financially if their formula shows positive clinical results. Some companies will have various people, clinics, patients, etc., test their formulas using their own various methods and/or types of patients. Each group will be tested at a different place by different people in a different way and for a different time span than the other groups. Then the company will go through all the various data from the different sources and will combine the data and somehow come up with an average IGF-1 result to report. Patients undergoing clinical trials should all be tested the same way under the same exact guidelines and circumstances. Lastly, some companies/sellers show what appears to be clinical studies on their web site, but they don't give the name of any doctors (where you can read their names), or the name of a facility where the study was suppose to have been done. There is obviously a reason for this. We give both the name of the doctors and the facility in which our clinical studies were carried out.